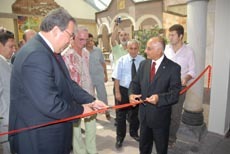 The Netherlands Babayan Culture House was founded in 2005 to promote greater understanding and cooperation among different peoples and nations through culture and art projects. The Babayan Culture House is closed in Turkey since 2017. We will continue in the Netherlands and inform through this website, email and intermediating organisations. The Foundation Babayan Culture House creates opportunities for intercultural dialogue between artists of all nationalities and all disciplines. The Babayan Culture House offers many possibilities for artmaking including, painting, drawing, photography, video, sound, new media, sculpture, installation, and performance. Cappadocia is a surrealistic landscape with tufa stone valleys, shaped centuries ago by the 'Erciyes' and other volcanoes. A part of this 40.000 square km area is a national park and an openair museum with many rock churches and monasteries, restored by UNESCO, because it is an official world heritage area. 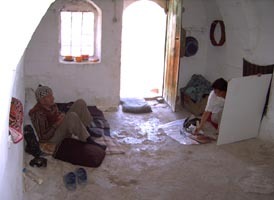 The microresidency type Babayan Culture House AiR was Cappadocia's first and only independent contemporary art residency, organized for artists by artists. Its mission is to build bridges of understanding between East and West by nourishing art and providing space for artistic experimentation; encouraging crosscultural dialogue, and collaborating with regional and international arts networks.  To provide artists with unrestricted time and space to research, develop and produce ongoing or new body of works/projects. 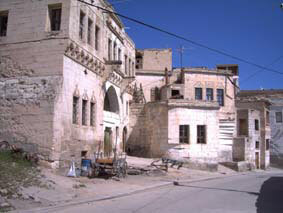  To introduce visiting artists to Cappadocian peoples, cultures and landscapes.  To provide the Cappadocian/Turkish community with exposure and access to a diverse range of contemporary international arts practices and theories.  To provide outreach activities such as talks, workshops and exhibitions, intended to promote interaction, awareness and professional development within the community. 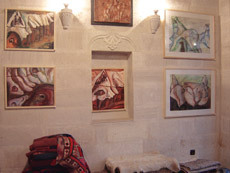 In the Cappadocia Center for Culture and Art / Kapadokya Kültür ve Sanat Merkezi in the provincial capital town of Nevsehir one can organize an exhibition, group or solo. In that case we advize to stay two months in residency. 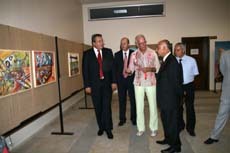 On the right you see the official opening ceremony of the exhibition of residency artist Leo van Velzen in August 2007 in the Kapadokya Center for Culture and Art, performed by both the Mayor (Belediye Baþkaný) Hasan Ünver of the capital Nevsehir and the Governor (Vali) M. Asým Hacýmustafaoðlu of the province of Nevsehir. The Babayan Culture House Foundation initiates and organizes art projects and stimulates intercultural exchange between artists of all nationalities. 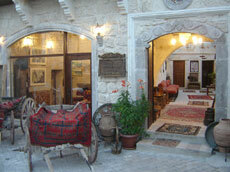 The Babayan Culture House is managed by professional artists with a more then 40year working experience. They stimulate a colleague atmosphere. An attitude of independency in project development is expected, besides an open mind towards the intercultural aspects of the stay. The Babayan Culture House acknowledges that some of the most creative strategies live in the intersections of disciplines, cultures and generations. The target groups for the residencies are International and local artists interested in fine art, contemporary art, environmental art, exploratory sitespecific art, public art and community based arts. An artist should have an adventurous attitude and be open to research within new approaches, experiences and meetings. A list of all residency artists can be found below. 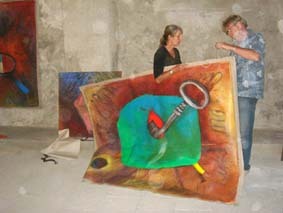 Karl Chinov (left)  Bulgaria/USA, 'antique door project', Rosa Lopez Callul (right)  Spain, painting 'uncle' Durmus in his house. Karl Ciesluk  Canada, Land art project development. representation by the Babayan Culture House (go to videos). 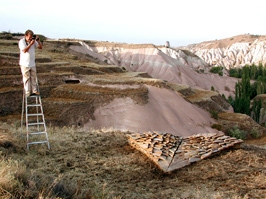 We aimed for 'Awareness by Art' through projects of the Art/Eco Platform, Cappadocia, an artist cooperation based on ecological and artistic themes such as: WATER! = BRIGHT? The Babayan Culture House is seeking actively for cooperation with art organizations (governmental and NGO). 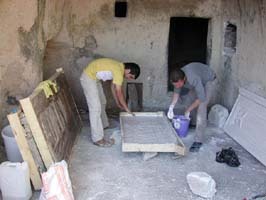 Also the Babayan Culture House works closely, and shares information with art residencies in similar circumstances. Newsletter 4  October 2009.
in the art residency from 2006  2010. ©BCHvideo2010. 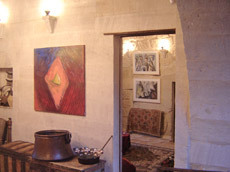 in the art residency from 2010 (continued)  2012. ©BCHvideo2013. Micheal Perrone (with Mariah Dekkenga ) USA/Qatar  1 month, painting/photography/filmmaking/sculpture. Mariah Dekkenga (with Micheal Perrone) USA/Qatar  1 month, painting/drawing/writing. Caroline Hawkins Australia  1 month, design/illustration/photography. Ute Eisinger Austria  1 month, poetry/art critics. Corina del Carmel Mexico  1 month, painting/drawing. Gabrielle Reeves USA/Turkey  3 weeks, painting/drawing/exhibition. Annika Katharina Thiems Fr/Ge  1 1/2 month, painting/drawing/installation. Lillian Kiser Taylor USA/Czech Republic  1 month, painting/drawing/printing/mixed media. Chris Vivas USA  1 month, ceramic/sculpture. Cori Beardsley USA  1 month, sculpture/installation/ceramics. Doug Russell USA  1 week research, drawing. Lana Sundberg USA  1 month, clay/mixed media. Frances Valesco USA  1 month, painting/printmaking. Gabrielle Reeves USA/Turkey  1 month, painting/drawing/exhibition. Duncan Gidney Canada/the Netherlands  1 month, film/photography. Cappadocia Blog. Eve Cohen USA  1 month, sculpture/costume/collage. Saskia Doherty Australia  2 weeks research, several visual media/ceramics/video & sound. Alix Anne Shaw USA  1 month, sculpture/poetry. Gracia Tobing  video's (with Tesla Manaf) Indonesia  1 month, narrative film/visual poem & music video. Tesla Manaf (with Gracia Tobing) Indonesia  1 month, composing/music. Stephen Vincent USA  2 weeks research, poetry/drawing/essayist. Anne Murray USA / Irish  1 month, video poetry/photography. Tsai Ming Chu Bloodworth Taiwan  1 month, pottery/ceramics. Jonny Briggs United Kingdom  1 month, photography/weaving. Jessica Panicola USA  1 month, ceramics/sculpture/mixed media. Peju Alatise Nigeria  1 month, mixed media/painting/sculpting. Nicole Murmann Switzerland  1 month, installation/drawings/soundscapes. Heather Freedman USA  2 weeks research, visual art/illustration/design. Liz Tran USA  1 month, painting/sculpture/installation. Carmi Weingrod USA  1 month, printmaking/drawing/installation. Gabrielle Reeves USA  2 weeks research, painting/drawing. Teresa Wilson (with Ammar Faiz) UK  2 weeks research, sculpture/installation. Ammar Faiz (with Teresa Wilson) Pakistan  research 2 weeks, video/sculpture/motion sensors/2d collages. Missy Hammond Dunaway USA  1½ month, painting. Gabrielle Reeves USA  1½ month, painting/drawing. BLOG. Olivia Valentine USA  2½ months, sculpture/installation/textiles. Stephen Vincent USA  1 month (follow up residency), poetry/drawing/essay. Louise Martin Scotland  1½ month, objects/drawing/weaving. Keli Arslancan USA  1 month, painting/drawing/video. Karin Gunnarsson Sweden/UK  1 month, photography/film. Ya-hsin, Hsiao Taiwan  1 month, painting/drawing. Summer Moore USA  1 month, photography/textiles. Krijnie Beyen Netherlands  2 week research, multimedia/photography/installation. Bishara Mohamed Canada  1 month, interdisciplinary. Lori Margaret USA  1 month, writing/drawing/screenplaystory editing. Soili Arha Finland  2 months, metal objects/textiles. Amanda Mitchell Australia  1 month painting/drawing. Stephen Vincent USA  1 month, poetry/drawing/essayist. Wendy Osher USA  1 month, visual art/installation. Project BLOG. Pamela Thompson USA  1 month, mixed media/light weight sculpture/installation/drawing. Artist portfolio. Ted Efremoff USA  1 month, new media. AiR project: Pigeon House Memorial. Emmie van Biervliet United Kingdom  1 month, mixed media/visual art. Rachel Wolfson USA  1 month, painting/drawing. Kate Temple USA  1 month, installation/painting/drawing. Residency projects (PDF): Seni/Beni Me/You Flower Carpet. Maria Katzman USA  1 month, painting. Larissa Figueiredo Mendes Brazil  1 month, cinema/new medias/creative writing/photography. Hanae Utamura Japan/United Kingdom  1 month, installation/video. Janet Morgan USA  2 weeks, painting. Nick Mann USA  1 month, 'Community Based Arts'/painting/muralism/installation. Sachiyo Honda Belgium/Japan  1 month, video/performance, video: 'blackhole whitehole'. 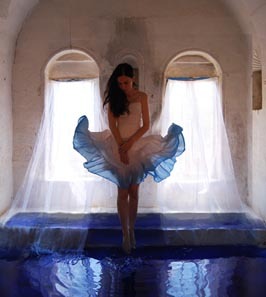 Olivia Valentine USA  sculpture/installation/textiles, several short research visits for an extended residency 2013. Shae Bishop USA  1 month, ceramics/fiber. Barbara Campisi USA  1 month, painting/installation/sculpting. Katie Murken USA  1 month, book arts/printmaking/installation. Tracey Meziane Benson and Martin Drury, Australia  1 month, visual art/digimapping: Project photo's, Geokult collaborative BLOG. Dorion Barill (with Christina Svenningsen) USA  2 months, visual arts/new media. BLOG. Christina Svenningsen (with Dorion Barill) USA  2 months, visual arts/new media. Augustus Veinoglou Greece/Scotland  1 month, sculpture/drawing. Angela Willcocks Australia/USA  1 month, new media/installation/drawing/painting. Aili Schmeltz USA  1 month, sculpture/installation/drawing/video. Aili's BLOG. Michele Beck USA  1 month, multidisciplinary/performance. BLOG. Karen McCoy (with Robert Carl) USA  10 day research program for residency, sculpture/drawing. Robert Carl (with Karen McCoy) USA  10 day research program for residency, music/sound art. Rebecca Clay Haynes USA  1 month, writing/literature. Viivi Nieminen Finland  1 month, photography. MaryEllen Campbell USA  1 month, book arts/painting/photography. Pamela Sparks USA  1 month, photography. Pat Alexander USA  1 month, painting/installation. 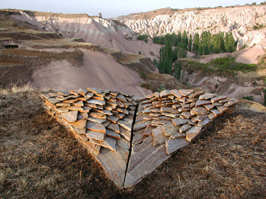 Firat Erdim USA/Turkey  1 month, textile/sculpting/architecture. Hsu Chiung Wen Taiwan  1 month, ceramic objects. Frances Valesco USA  1 month, works on paper/mixed media. Mary Judge USA  1 month, painting/drawing/objects. Studio Visit: Mary Judge. Louise Thomas United Kingdom  1 month, sculpting/ceramics. Margaret Karczmarzyk Poland  1 month, painting/installation/performance. Mara Held USA  1 month, painting/drawing/objects Stained glass: 'El in 16 Notes'. Athanasios Baxopoulos Greece  1 month, photography. Sherry Millner (with Ernest Larsen) USA  1 month, video. Ernest Larsen (with Sherry Millner) USA  1 month, video. Carla Ori Australia  1 month, music/images. Georgia Gray USA  1 month, painting/objects/sculpting. Angie Rizzo USA  1 month, sculpting/textiles/installation. Christine Harrison Australia  1 month, drawing/painting/printing/installation. Camille Roos USA  1 month, painting. Amy Guion Clay USA  1 month, painting. BLOG about the project. Monika Kimrey USA  1 month, painting/drawing, objects/tapestries. Leonie Muller NL  1 month, performance/installation. Video's made in residency. Josie Martin New Zealand  2 months, painting. Hanneke van Velzen NL  1 month, photography. Frédérick Belzile Canada  one month, video/installation. Elizabeth Gulick USA  1 month, textile/felt. Marina Carvalho Portugal  2 months, wooden objects. Catalogue (PDF 1.40Mb). The making of 'Watertree'. Juha Saitajoki (PDF Finnish, images: p39 and p65), Finland/Lapland  1 month, painting/drawing. Article about the artist: Reflections and Connections (PDF p31). Lisa MacLean Canada  1 month, photography/mixed media/installation. Residency art work catalogue (PDF 3.19Mb) Memento Mori Memento Mori photo series. Farkaskõ Cave Art Association Hungary  1 week workshop/meetings, cave installations. Ingrid Buuck USA  2 weeks, painting/graphic design. Dutch Art Institute NL  2 weeks, 5 master students, research/art project/waterproject. Paul Wiegerinck IOTKgroup NL  3 weeks, video/water project. Susan de Kruiff IOTKgroup NL  3 weeks, video/water project. Tiny Schilder IOTKgroup NL  3 weeks, photography/water project. Clemens Zalm IOTKgroup NL  3 weeks, photo-based media/water project. Rineke Kop IOTKgroup NL  3 weeks, painting/water project. Margriet Westervaarder IOTKgroup NL  3 weeks, painting/photography. Stefan Chinov USA/Bulgaria  1 month, in situ objects. Rosa Lopez Calull Spain  1 month, painting. Josie Martin New Zealand  2 months, painting/sculpting. Tina Eskilsson Sweden  2 weeks, water project/installations. Susan Mains Grenada/Caribbean  1 month, painting. Anna van Stuivenberg, NL  1 week preparatory research, visual art. Renate Sennewald, DE  1 week preparatory research, jewelery. Karl Ciesluk, Canada  1 month, in situ objects. Susan Arthur, USA  1 month, photobased media. Alia Toor Canada  1 month, installation/photography. Margarita Kiselicka, Macedonia  1 month, water project/sculpting. Simon Kalajdziev, Macedonia  1 month, installation/sculpting. Silvie Krens, Netherlands  1 month, painting. Maaike Roozenburg NL  2 months, design/objects. Felice NL  1 month, painting/theatre. Josian Stikkelbroek (pdf) NL  2 weeks, painting/sculpting. Leo van Velzen NL  3 months, painting. © 2019  website design Willemijn Bouman.